Here at Cranfield University we are putting in place plans related to the new ‘Living Laboratory’ project, part of our ‘Urban Observatory’. This project sits within the wider UKCRIC initiative, across a number of universities. 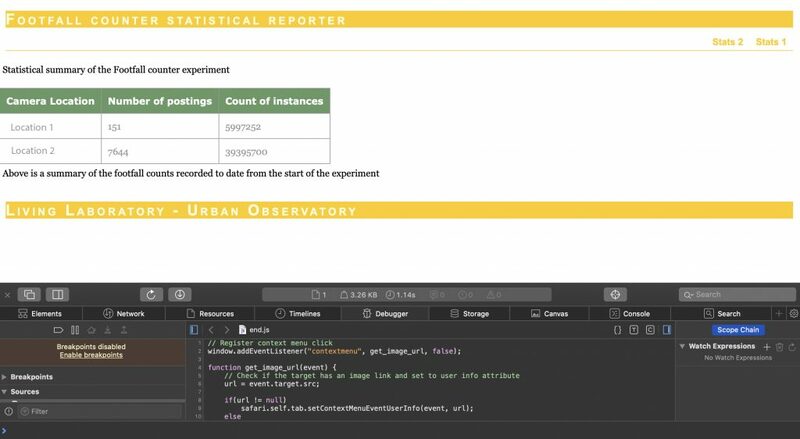 Of the many experiments in development, we are gathering environmental data from IoT devices and building data dashboards to show the data and related analyses. One such device we use is the Particle Photon, and a typical attached device for environmental sensing is the DHT11 temperature/humidity sensor. We have discussed building the hardware to do this in an earlier blog. 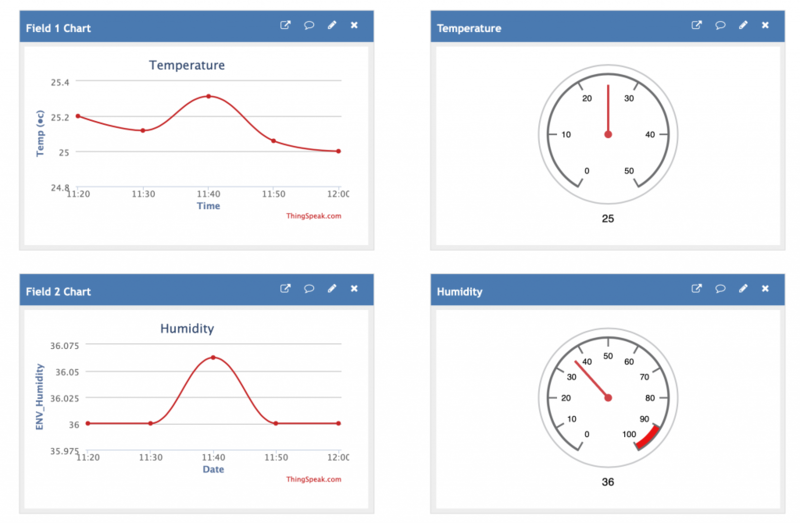 But here in this blog, we consider how to use ‘ThingSpeak‘, the ‘open IoT platform with MATLAB analytics‘ to receive, visualise and analyse the data. In this way, the Particle Photon will be used to collect the data, will transmit it to the Particle Cloud, and from there, a ‘WebHook integration’ will transmit the data to ThingSpeak for further use. For the code, we adapted the AdaFruit DHT11 sketch for Photon. Having calculated temperature (t), humidity (h), heat index (hi) and dew point (dp), the values are published (Particle.publish) up to the Particle Cloud. // Must send in temp here in Fahrenheit! Note the request format is JSON. Then, selecting the ‘Advanced Settings‘, we enter the following as the JSON block, attaching each parameter to a field number that will then appear in the ThingSpeak Channel. Hitting ‘Save’ should save and start up the Integration. Next, following the Particle Tutorial example, we created a new (free) ThingSpeak account to receive and process the data. Finally, we save the Channel, and are ready to then visualise the data. ThingSpeak allows us to direct the data received into a number of app tools, graphs, messaging utilities, analytics, MatLab and so on. Here we simply directed the output to a line graph and a gauge graphic. In the case below, the line graph type is set to ‘Spline’ on a ’10 minute’ average, and the temperature gauge range set from 0-50. This exercise has shown how to build a WebHook Integration from a Particle Photon, and to package up multiple data items as a JSON block, to pass this through the Particle Cloud and on to ThingSpeak for visualisation. Yet to be explored are the many other tools ThingSpeak offers for processing the data: MatLab Analysis and Visualisations, PlugIns, ThingTweet, TimeControl, React, TalkBack and ThingHTTP. ThingSpeak is a great online tool for handling IoT data, but note it is not the only choice available, and there are other similar online tools that could be used. Alternatively, one could also build a solution ‘in-house’ using packages such as ThingsBoard to receive, process and visualise the data arising from the IoT sensors. A good review of the choices of tools available is online on this blog, and there is lots of choice. A final note is that in any operational system, data security should be considered, and HTTP authentication can help with this. All the stages of data transport in this example support Authorisation for example. Also the transport mechanisms could be investigated, such as MQTT. 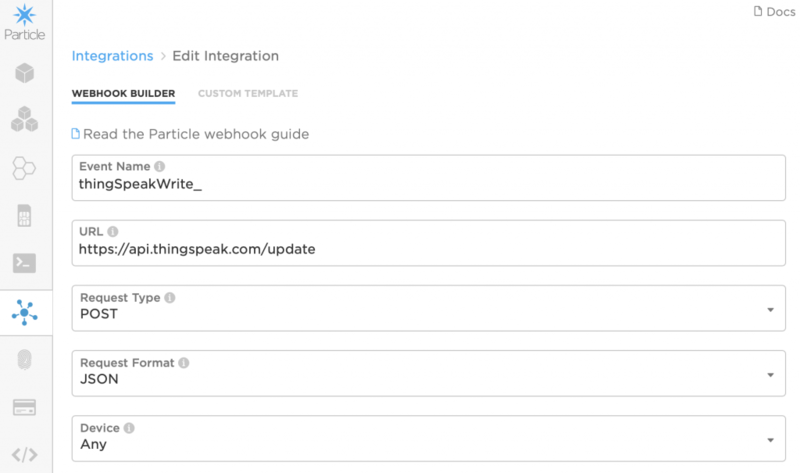 This entry was posted in Sensor and tagged Integration, JSON, Photon, ThingSpeak, WebHook on April 17, 2019 by admin. Here at Cranfield University we are putting in place plans related to the new ‘Living Laboratory’ project, part of our ‘Urban Observatory’. This project sits within the wider UKCRIC initiative, across a number of universities. Of the many experiments in development, we are exploring machine vision as a means to provide footfall counts of pedestrian traffic in parts of the campus. This blog builds on an earlier blog summarising some of the technical considerations relating to this work, and shows how a simple dashboard can be developed with NodeJS and the templating engine pug. In the earlier blog, we captured sensor data from Raspberry Pi Zeros with cameras, running Kerboros, to a Postgres database. This quickly builds up a vast body of data in the database. Finding a way to present this data in a web-based dashboard will help us investigate and evaluate the experiment results. We investigated a range of tools for presenting the data in this way. The project is already using Node.js to receive postings from the cameras using HTTP POST requests. The Node.js environment then communicates with the back-end Postgres database to INSERT new records. The same Node.js environment can also be used to serve up the results of queries made of the database in response to standard HTTP GET requests. Note in index.js the app settings. app.set views tells pug where the templates will be stored for generating the web page. app.set. engine tells Node.js to use pug to generate the content. Note also the new REST endpoint ‘/stats’ introduced with an HTTP GET request (app.get), and is associated with the Node.js function getStats in the associated queries.js module (file). Note in queries.js the definition of the function getStats. This function is associated with the HTTP GET request on ‘/stats’ from the earlier index.js file. The function returns a status of ‘200’ and then calls the pug render function with a couple of parameters, first the title of the resultant web page we want, and then more importantly the recordset (‘rows’) resulting from the SQL query – the entire object is passed through. Lastly, getStats is added to the module exports at the end of the file. Next we have to set up the pug template and style sheet used to generate the HTML file output. Note we defined the folder ‘views’ to hold these files in ‘index.js’. We create a new folder called ‘views’ and create a pug template file called ‘stats.pug’. Pug files all have the extension ‘.pug’. Not all the definitions in the CSS are used, but it is a useful set of styles. The file ‘stats.css’ is placed alongside ‘stats.pug’ in the ‘views’ folder. The app is up and running again, and hopefully continuing to receive data from the cameras with the HTTP POST requests arriving at the end-point ‘/footfall’. However, now, we can also point our web browser at the end-point ‘/stats’, and we should hopefully see the following simple dashboard report. The blog here described taking data from a Postgres database via a custom SELECT statement and using Node.js to paste data to the JavaScrip templating engine pug to prepare a simple HTML dashboard. Future work could consider improved graphics, perhaps drawing from the graphics library D3, and its port to Node.js, d3-npm. This entry was posted in Databases, Open Source, Sensor and tagged Node.js, Postgres, pug on April 10, 2019 by admin. Here at Cranfield University we are putting in place plans related to the new ‘Living Laboratory’ project, part of our ‘Urban Observatory’. This project sits within the wider UKCRIC initiative, across a number of universities. Of the many experiments in development, we are exploring machine vision as a means to provide footfall counts of pedestrian traffic in parts of the campus. This blog provides summarises some of the technical considerations relating to this work. Earlier blogs here on GeoThread have described the use of a Raspberry Pi Zero running the Kerboros software, which uses OpenCV to capture movement in different ways from an attached, or network connected, camera. One of the great additions to Kerboros is a feature permitting ‘counting’ of objects passing between two identified ‘fences’ within the image view. The results of an event being triggered in this way can be output to a range of IO streams. Thus IO can send a result to a stored image file to disk (Disk), send a snippet of video to disk (Video), trigger the GPIO pins on the Raspberry Pi (GPIO), send a packet to a TCP Socket (TCPSocket), send a HTTP POST REST communication (Webhook), run a local (Script), trigger a MQ Telemetry Transport communication (MQTT) or send a push notification message (Pushbullet) – a great selection of choices, to which is also added the ability to write to the Amazon S3 cloud as well as local disk. Outputs can be made in either single streams, or multiple streams – thus one can save an image to disk ‘and‘ run a script for example. In an earlier blog, we had logged movements in this way to a bash script that executed a series of one-line Python commands to store the triggered output data to disk, appending to a CSV file. However, this approach only offers a limited solution, especially if there are multiple cameras involved. A better strategy is to write data out to a REST endpoint on a web server, using the Webhook capability. In this way the posted JSON data can be collated into a central database (from multiple camera sources). The reason for this port number, and REST endpoint are made clear in the NodeJS receiver code below. We set up a separate server running Linux Ubuntu to receive these data. 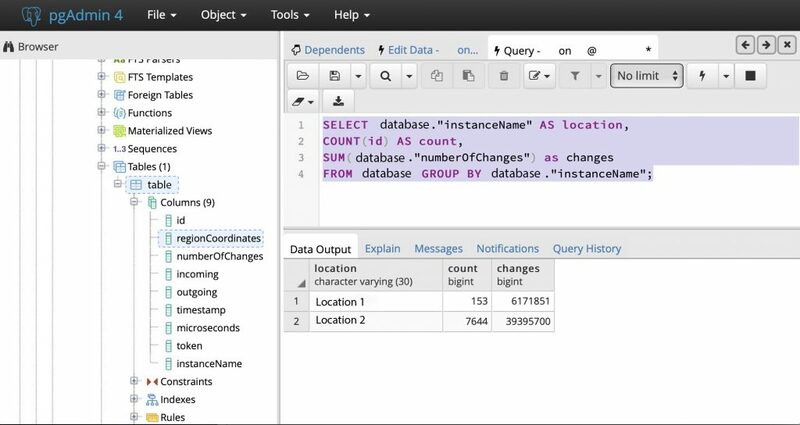 For a database, we selected Postgres as a popular and powerful Open Source SQL database. As a server, able to receive the HTTP POST communication, we selected NodeJS. Once installed, we also used the Node Package Manager (NPM) to install the Express lightweight web server, as well as the Node Postgres framework, node-postgres. We then used PSQL (the Postgres command line utility) to update the system password, and then to add a new user to Postgres to own the resultant database. Finally, a review of the commands to start, stop and restart Postgres. One thing to note in the code above is the use of ‘RETURNING *’ within the SQL statement – this allows the ‘result’ object to access the full row of data, including the automatically generated Id reference. Otherwise this would not be accessible as it it generated on the server and not passed in by the INSERT statement. Now the Node application is started up, listening on port 3000 on the REST endpoint /counter’ (both defined in index.js). 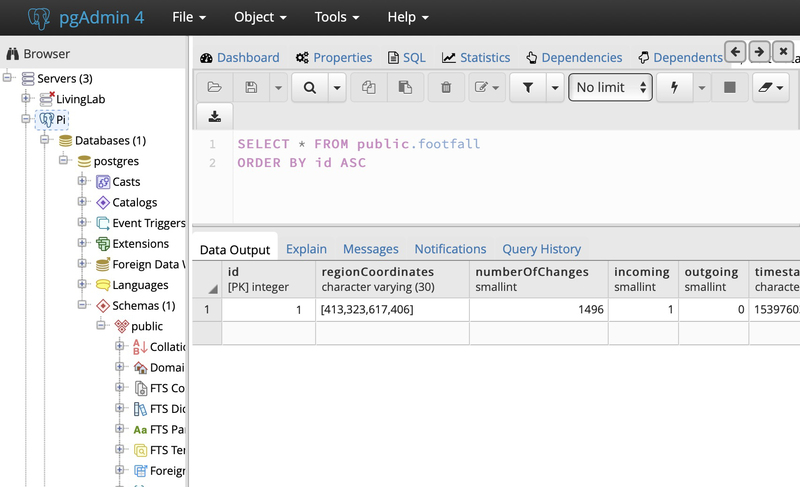 The result is data streaming into the Postgres database. Note here the port number of 3000 referenced, and also a request from Manchester. Once the Kerboros software is updated, data should be seen to be arriving at the database. pgAdmin can be used again to inspect the result. 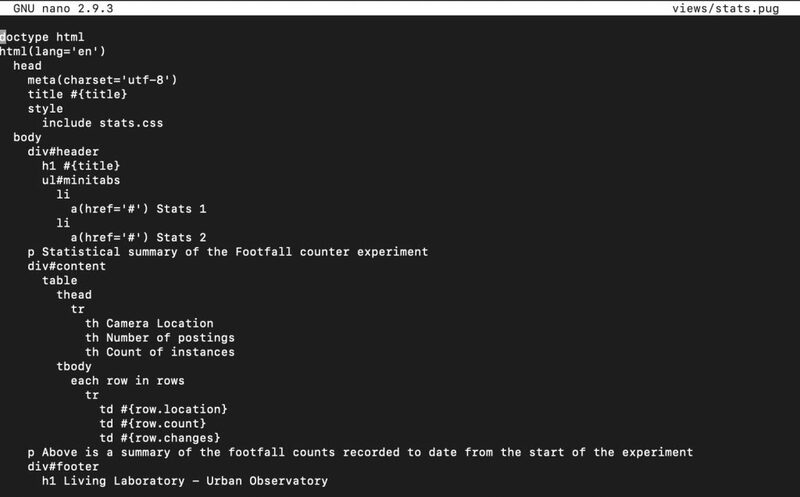 This blog has shown how to capture footfall counting data sourced from a Rasberry Pi with a camera running Kerboros, to a separate server running the database Postgres, using NodeJS and related packages. The result is a robust logging environment capable of receiving data from one or more cameras logged to database. You should now just wait for data to arrive – using pgAdmin to inspect and interrogate the database table. This entry was posted in Machine Vision, Raspberry Pi, Sensor and tagged Kerboros, Postgres, Raspberry Pi Zero on April 7, 2019 by admin. Here at Cranfield University we are putting in place plans related to the new ‘Living Laboratory’ project, part of our ‘Urban Observatory’. This project sits within the wider UKCRIC initiative, across a number of universities. Of the many experiments in development, we are exploring machine vision as a means to provide footfall counts of pedestrian traffic in parts of the campus. This blog provides summarises some of the ethical considerations relating to this work. An important early part of this project involves preparing, submitting and securing ethical approval for the planned work. In the first instance we are running an experiment in a particular campus office area. Before commencing any technical work, a full approval case has to be prepared and submitted for assessment. In the case of this experiment, we are intending to log only a count of pedestrian movements, with no personally identifiable imagery captured. 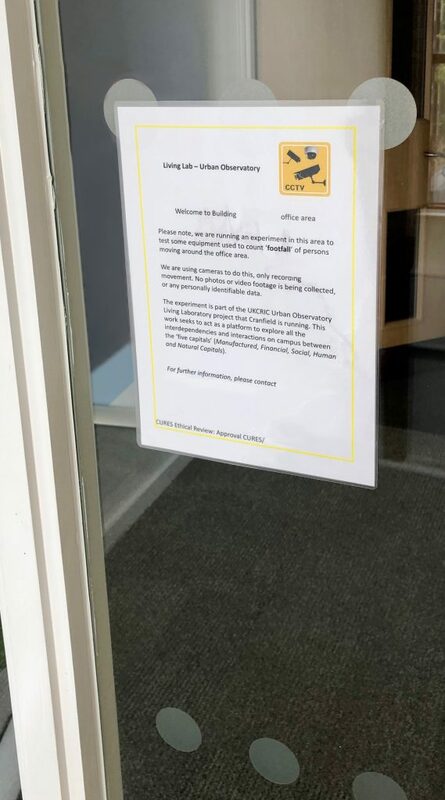 Informed written consent is obtained from all residents of the office area, and signage put up for visitors, see below. The case outlining these intentions is drawn up and submitted. These matters are raised here as a precursor to the technical description to follow, as IoT projects require careful consideration of privacy matters. This entry was posted in Artificial Intelligence, GIS, Machine Vision, Raspberry Pi, Sensor and tagged CCTV, ethics, Footfall, Raspberry Pi on April 7, 2019 by admin. Here at Cranfield University we use Raspberry Pi computers for a number of applications, such as monitoring environmental sensors and processing data. The devices get moved around the campus and need to work across multiple WiFi networks with ease ad without the need for reconfiguration. Here is how this is done (make backups of the files before editing!). Reboot the Pi after the edits. This approach uses DHCP for connecting to the network. This entry was posted in Python and tagged Networks, TCP/IP, WiFi on April 6, 2019 by admin. Here at Cranfield University we are interested in the ‘Internet of Things’ for environmental sensing. In this blog, we use one off SeedStudio’s Wio Node devices, with a home-made connection to a one wire temperature sensor, and finally an IOS shortcut on an iPhone to read and speak the value using Siri. In part, this blog follows this project. Microprocessor: We’ve had a few projects reported here with Arduino’s, Photons and Raspberry Pis, so it was interesting to get hold of a Wio Node device from Seeed Studio. This is an inexpensive ESP8266 based open-source Wi-Fi development board that supports Seeed’s Plug-n-Play Grove standard. There are two Grove sockets on the Node device. The node is marketed as permitting one to create a working IoT application in 5 minutes. Key to this is the Plug-n-Play physical sensor design, and the modular software tools in the app. Sensor: To measure temperature, we used a DS18B20 Waterproof Temperature Sensor, available cheaply from a range of sources, such as here. The three wires are Red(VCC), Yellow (DATA), Black(GND). The Grove standard is a modular, standardized connector prototyping system, permitting Plug-n-Play connectivity with scores of sensor devices for measuring a wide range of phenomena. The advantage of Seeed Studio’s Wio range is that these simply plug into the sockets on the board. However, if one has a sensor without a Grove plug, there is a Protoshield prototyping board available. This can be used to wire up a sensor such as the DS18B20 to allow it to be connected. After wiring up the temperature sensor as shown, and plugging it in, we could turn to the software to control it. There is a Wio Link App available for smartphones, such as the Apple phone, that hugely simplifies the process of plugging in and operating sensors. We installed the app, and followed the simple instructions to add a new Wio Node device, and to enable Wi-Fi on it. Once this was working, we configured the Node to add our new sensor to the ‘S0’ port (there are two ports – S0 and S1). The option used was ‘One Wire Temperature Sensor’ on the GPIO toolbar. Once this was working, we ‘flashed’ the new settings onto the Node via the ‘Update Firmware’ option. Next, we could view the API settings for the new configuration. The URL REST endpoints are shown and can be used to access the temperature value from the sensor. A test option within the app allows one to access the reading directly. To access the actual value from the JSON, we will need to extract the number from the data pair (see step 3 below). Once we were happy the approach was all working, we copied the URL off for use in the next stage of the project. The project at this point is all working well – the temperature sensor reports to the Wio Node, and an API REST URL can be used to access the value. However, we can go further. We next used an Apple iPhone X, and its newly introduced ‘Shortcuts’ capability. This involves firstly installing the Shortcuts app from the iTunes App Store. Shortcuts allow one to build a relatively sophisticated programme very simply. We therefore set out to develop a ‘Shortcut’ that accessed the new sensor – for this we needed the URL (REST endpoint) from before. The shortcut settings are shown below, namely: (1) URL – enter in the URL from above; (2) Get Contents of URL [use Advanced options – method: GET, Header: temperature; (3) Get Dictionary Value [Key – temperature]; (4) Set Variable [Temperature] (saves value off to a new variable called Temperature); (5) Text [degrees Celsius] (creates a block of text to append); (6) Add to Variable [Temperature] (appends text to variable); (7) Combine Text [Separator – New Lines]; (8) Speak Text [Wait Until Finished]. A further elaboration is to use the ‘If‘ statement to check there was a valid reading (e.g. temperature > -20) ‘Else‘ advise of a problem. We then added a custom icon ‘glyph’ (thermometer!) and colouring for the shortcut, and added this to the home screen of the phone. This allows the shortcut to be run easily. As a final finishing touch, we then also added a Siri shortcut with a simple voice command ‘temperature’ – this allows one to call ‘Hey Siri’ and give the command. The device sensor temperature reading is then spoken back. Pretty amazing! See the video below for an example. This approach worked well, and could be developed to work with any of the other Grove sensors plugged into the Wio Node. For more complex projects, the Wio Node, with its two connectors could be limiting. 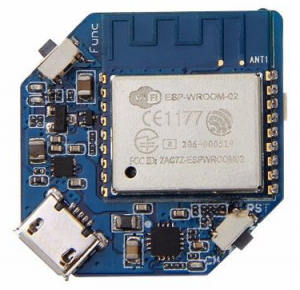 Fortunately there are a whole range of extended micro controllers, such as the Wio Link, with 6 Grove connectors – as well as lots of great projects to try. This entry was posted in EPS32, Sensor and tagged DS18B20, Hey Siri, IoT, Seed Studio, Wio Link, Wio Node on December 31, 2018 by admin.